The Backcountry Trail is designing its first calendar and would like for our greatest fans to be a part of the photos and adventures we share. If you have digital photographs you would like to submit, please email them to backcountrytrailoba@gmail.com with the subject line “Backcountry Trail Favorite Photo”. A maximum of 3 photos may be submitted per entry. Provide hi-res uncompressed JPG images together with your name, phone number and caption. We Thank You for your continued support of the Hugh S. Branyon Backcountry Trail and look forward to all the entries! Submission Rules: Submitting a photo certifies that his/her entry is original, has not been previously published or won any award, and does not contain any material that would violate or infringe upon the rights of any third party, including copyrights, trademarks or rights of privacy or publicity. 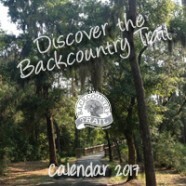 The value of photographs selected and printed is $0 and by submitting your photo, you consent to the use of that photo for print in the Hugh S. Branyon Backcountry Trail 2017 Calendar without compensation.